We had the money to fully fund our HSA, about $1,500 a year each. Of course, given that our deductible was more than that, it didn’t really offset costs, just reduced our tax burden slightly. Did it make it easier to find affordable health insurance? No. Did it improve the quality of the health insurance available to us? No. Did it reduce our healthcare costs? No. Did it leave more money in our pocket? No. Did it impel us to shop around for the least expensive medical services? No. Could we have funded the HSA if we didn’t money in savings? No. So why do the Republicans think that high-deductible health plans and their attendant HSAs will help people afford health insurance? To be clear, the proposal would allow individuals to use tax-subsidized HSAs to pay for health insurance premiums and up to $1,000 a year in exercise equipment and fitness club membership fees. In one proposed plan, individuals could bank up to $9,000 a year; families up to $18,000. But most Americans will still need their own money to fund that HSA since it doesn’t sound like the federal government will do it for them. There are several problems with this plan. People with high-deductible plans use less health care. They stop taking their medication and getting lab tests. Nearly half report problems paying their medical bills. They skip preventive care even though most preventive care is available with no out-of-pocket costs (thanks, ACA!). In the end, this can drive up medical costs because conditions that can be controlled on a chronic basis exacerbate into acute episodes that require more expensive care. People with high-deductible health plans don’t do what everyone thought they’d do, which the Republican plan banks on: shop for the cheapest option when they need health care. (Good study here from economist Paul Fronstin). I have one question: How will this make health insurance on the individual market more affordable and ensure that my insurance company can’t discriminate against me for pre-existing conditions? 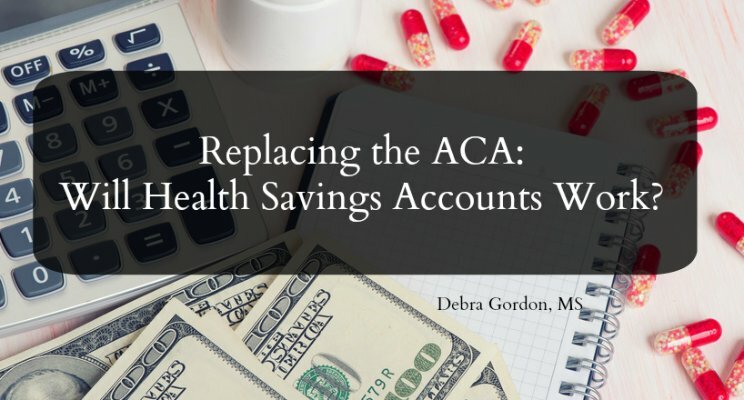 Want to read more about the Republican plan to use HSAs as part of any Obamacare replacement? The Atlantic has a great article on this. Want to read more about the various options for replacing the ACA? Here’s a good article from Health Affairs.